The last time I checked, Amazon offers 73,364 titles in the general category of “Innovation” and 2,588 in the more specific category, “Innovation: Entrepreneurship.” Why another? As with a comparable residential real estate aphorism that for every house there is a buyer, its counterpart in publishing suggests that for every reader there is a book. I am certain that those who read this book with appropriate care will find much of value in what Osama A. Hashmi has to say about the disciplines of thought that can help aspiring entrepreneurs to “rethink industries and unlock [up to, perhaps] 10x better solutions.” Think of this book as a primer, one in which Hashmi offers a briefing on basics rather than a definitive explanation of them. Hashmi immediately establishes and then sustains a direct, informal, indeed conversational rapport with his reader. He would be an eager collaborator during what he hopes will be a journey of personal discovery for each person who reads his book. Based on my own experiences with hundreds of small-to-midsize companies, I know that both Innovation-Thinking and Design-Thinking can be helpful and the same is true of both incremental and transformational innovation as well as true of both vertical/linear and lateral thinking. It is no coincidence that most of the companies annually ranked among those that are most highly admired and best to work for are also annually ranked among those that are most profitable and have the greatest cap value in their SIC classification. Moreover, however different they may be in most other respects, all of them have a workplace culture within which personal growth and professional development are most likely to thrive. 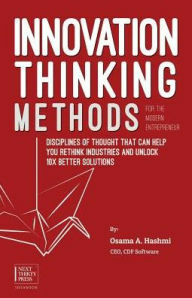 I commend Osama Hashmi for demonstrating innovative thinking when explaining Innovation-Thinking. That is not a tautological statement. On the contrary. As the most innovative companies clearly demonstrate, their leaders think innovatively about how to improve what they do and how they do in terms of both products and services as well as in relationships with stakeholders at all levels and in all areas of operation. Innovation Thinking Methods is by no means a definitive source but it nonetheless serves a purpose of incalculable value: It calls to action everyone who can challenge all premises and assumptions; who are determined to know what works, what doesn’t, and why; who are resilient within a competitive marketplace that is volatile, uncertain, complex, and ambiguous; and who see each crisis as an opportunity to seize, not as a peril to be feared.